All items previously discussed are on my must have list. If a boat I am considering does not have the features described in PART ONE, it is not the boat for me. PART TWO: Rigging and fishing your new boat. 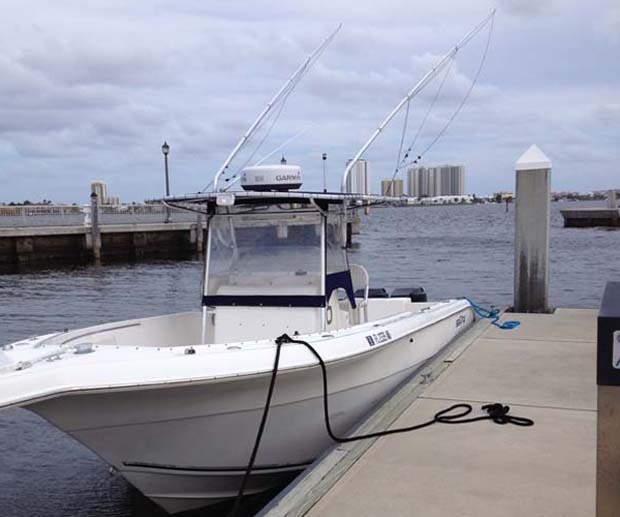 Grant’s 28-foot offshore fly fishing rigged deep V hull with outriggers. Iam a staunch believer in having outriggers. However, you might be asking why would you want outriggers? Aren’t they in the way when you are trying to cast? The answer is that they’re highly effective in locating and raising fish. The ocean is a big place and sight casting is often limited to special situations like busting fish or weed lines. If you’re fly fishing then trolling with hook-less lures on the outriggers will really aid in raising fish. Using this technique here in South Florida, you can raise dolphin, sailfish and many other species of game fish. When game fish are raised, yank the hook-less lure and pitch your fly as close to fish as possible. Sails are not at all boat or motor shy and dolphin can be approached rather closely, especially if you can keep a hooked one in the water. The best play is to pull hook-less lures when you’ve raised fish, then shut down the motors and start chumming and/or casting in hopes you are in the right spot. You can also use outriggers to launch a fishing kite when the winds are less than favorable for applying the aforementioned techniques. The most exciting way to fish with a kite, utilizing outriggers, is to launch a flying fish (no hook) to attract gamefish to throw a fly at . Personally, I prefer to have all the electronic bells and whistles: GPS, Sonar, Radar, VHF, CD Player and an iPod adapter. You’ll find having all these tools useful on every outing whether your fishing or just out for the day with friends and family. You must have is a VHF. Handheld VHF’s are fine but spend the extra money to get a fixed mount one. It may be the one piece of equipment that could save your life if in trouble. There have been a lot of new products on the market involving touch screens. Personally, I am not a fan because when your hands are full of scales, blood or when your hands and fingers are wet – touch doesn’t work very well. Call me old fashioned but I prefer the buttons. Contact your your local west marine or outfitter as they will know much more than I ever will when it comes to the current electronics offerings, however I will say that all the electronics and safety equipment in the world are not a substitute for good judgment and sound decision making. One valuable tool that I strongly recommend is a thru-hull transducer for your fishfinder/sounder. It will read the bottom very well and makes locating reefs much easier. I would recommend a minimum of 500W for offshore applications in water from 100- to 1000-feet. Many boats lack storage. When choosing a boat for purchase, I carefully consider the storage options. I like storage for extra fly lines, flies, rods, reels, hooks etc. I typically bring a weather proof bag with all my extra items and stick that in the cabin of the center console. While I rarely need them, I find comfort in not leaving home without them. At this point your boat should be about set to fish. Now all we have to do is rig it for fly fishing and fish it. Stay tuned for my conclusion, PART THREE.